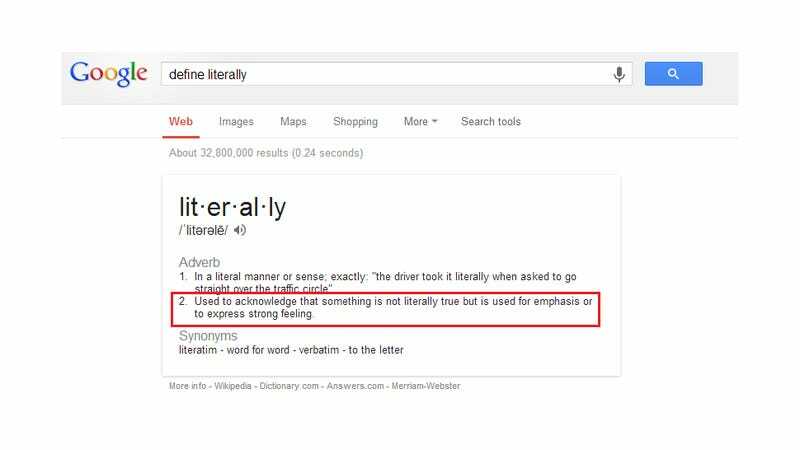 Grammar loving folks who love to point out where commas should be inserted instead of periods and how semi-colons are both simultaneously underused and overused, should pick up their red pens, furrowed brows and pitchforks at the fact that the definition of literally is literally no longer the literal definition of literally. The trolls who say "literally" when they're being completely non-literal and say it as an exaggeration or emphasizing something have won. Before I shatter too many glass houses with figurative rocks, I'm totally guilty of using literally like this make believe secondary definition too. I'm literally baking from the heat. I'm literally dying from this workout. And so on. In fact, a lot of numb nuts like me probably use the fake literally in our broken down form of un-English moreso than the actual literally of real English. That's why us people who don't deserve nice things ruin everything. Even if dictionaries should be applauded for changing with the times and explaining various usage scenarios of a word, we now have a word that means nothing. Literally. Or maybe not, who knows anymore.